As soon as the snow melts and the ground is somewhat thawed, it is the perfect time to start getting your deck ready for spring. This way, you can spend more time relaxing and enjoying your deck later on in the warm summer sun. Winter is often hard on decks; especially those made of all wood. It can cause any number of issues from simple dirt and debris buildup, to warping, splintering, cracking, and even collapse. The first thing to do is inspect your deck for damage. Check the floor for loose or raise boards and popped nails. See if the railings are loose at all and that they are free from splinters and raised nails or screws. Posts and post tops should be firmly in place as well as the spindles. If you see any signs of damage, replace or repair the problem areas. Composite or vinyl decking may not require as much maintenance as a traditional wood, but you but you still may want to inspect the support structure below. Bounce up and down on the deck and see if the structure seems weakened. If there is some movement, it may be as simple as tightening a couple lag bolts. Once you are certain the deck is structurally ready for the upcoming season, it most likely could use a little cleaning. No matter what material you deck is made of, Mother Nature doesn’t discriminate. The leftover mess of debris, leaves, and branches will be the same. There are a couple cleaning options; each depends on your layout and size of your deck, as well as the amount of nearby vegetation that may be susceptible to chemicals. The first step is to completely clear the deck of any furniture, rugs, grills, planters, etc. Next, sweep off the area and “floss” out between the boards to promote water flow when you clean. If you prefer to use chemical cleaners, you can choose from a mild bleach solution or one of many deck cleaning products available. Be sure to follow the labeled instructions to avoid using too strong of a solution or damaging your surrounding plants. If you prefer to use a power washer, be sure to use slow, even strokes to prevent scoring the wood or stripping away too much of the surface. While cleaning, if you notice any raised nails or screws, be sure to countersink them. Your family’s bare feet will thank you. 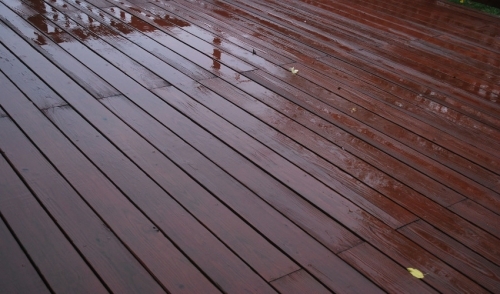 Once the deck is clean and has had time to dry, take a look and decide if it’s time for a new coat of sealant. Typically, decks should be resealed or re-stained every 2 to 4 years to get the most life out of the materials. If you’re not happy with the weathered look your deck has taken on, you may want to consider an opaque, pigmented stain that will rejuvenate your deck with a solid consistent color, giving your deck a whole new look. Beyond repairing, cleaning, and staining, there are other things you can do to get your deck ready for spring. Why not consider adding to, or modifying your deck before the season starts? You could swap out those tired old corded lights for hassle-free solar lighting. Planter boxes are relatively easy to build and simple to maintain. They’re also a great way to incorporate greenery into your deck. Built-in benches are another add-on that can help make more efficient use of your space. Finally, simply replacing your deck furniture with a new set can make a huge impact on the overall look of your deck.